Indiana State Roads 45 and 46 run directly through Bloomington, using a route that is known as "the bypass." Since the road was first paved, Bloomington has grown considerably and now there is dense development along many portions of the bypass. According to the Bloomington Bike & Ped Safety Commission's 2010 College Mall Pedestrian Accessibility Study, the neighborhoods bordering the south-east end of the bypass feature such dense development that they would be completely walkable if the roads in that area were not designed around the bypass. That is to say, there are thousands of people who live within a fifteen minute walk of groceries, shopping, and even employment opportunities. But because most of the roads in that area connect only to the bypass, in practice pedestrians are too afraid to go outside without the protection of a steel caged automobile. As such the bypass represents one of the greatest challenges to Bloomington's transportation infrastructure. As the only highway that bisects our city it serves as the major conduit for sprawl. Bypass users naturally demand that a greater percentage of our land is devoted to parking (which actively deters pedestrians). To make matters worse, as they zoom past our commercial districts, our business owners don't see their dollars. We get their traffic, pollution, and fatality statistics, but we do not get their contribution to our local economy except in small measured doses. Bypass users bypass Bloomington community. The Indiana Department of Transportation (INDOT) has long viewed state roads as nothing more than intercity highways, even when they run through cities such as Bloomington. Many decades ago, they hatched a plan to widen the bypass in anticipation of dramatically increased traffic congestion. The dramatic increases never appeared but the funding finally came through and in 2009 they scheduled the letting of a major expansion project for the bypass. Thanks in part to the efforts of B-TOP members, they delayed the project until 2010. But they have now let the project and construction is scheduled to begin "any day now." What INDOT doesn't know is that in dense urban areas added travel lanes actually increase congestion at intersections, creating a roadway which is overall slower. They made a plan appropriate to a limited-access freeway even while they are adding more intersections to the road. So B-TOP has made the bypass one of our focuses, and we have taken a few actions in connection with it. We have conducted a couple studies to address some of the common misconceptions about the bypass. 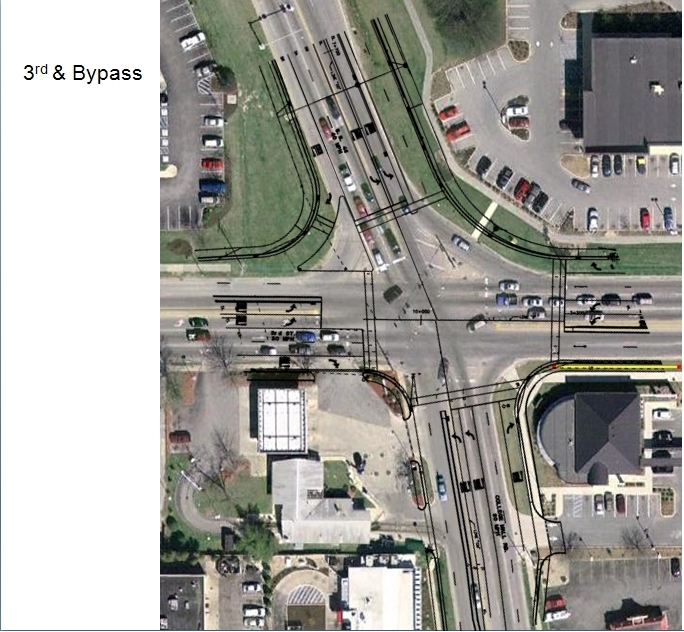 In August 2007 volunteers counted pedestrians at the intersection of 3rd and the bypass. This intersection is the gateway between Indiana University's Bloomington campus (which houses tens of thousands of students) and College Mall (a shopping district). Even though the intersection is extremely dangerous, we found that about 400 pedestrians a day crossed it. Many of them waiting a long time and then literally running for their lives. 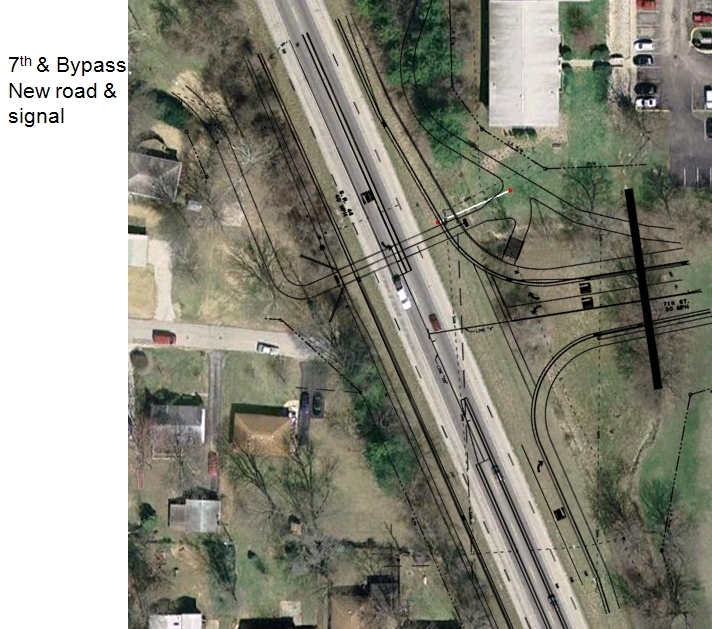 In May 2010 we conducted a travel time study of the section of the bypass which INDOT proposes to widen. We found that transit times only exceeded 15 minutes for a brief moment exactly at the peak of evening rush hour. At all other times of the day it took less than 12 minutes and at most other times of day it was about 8. Compared to big cities with actual congestion problems, our bypass is small potatoes. We summed up our opposition to the plan in a document titled Bypassing Good Judgment. It details not only our own efforts in relation to the bypass but data collected by INDOT itself, lies from INDOT officials, and the process by which INDOT has perpetrated this folly on Bloomington. They have ignored not only the input of our citizens and our leaders, but also the United States Departent of Transportation and our Master Thoroughfare Plan. Tree removal plan - Detailed aerial photographs of the project area, with black marks on all of the trees that will be bulldozed. A letter from Bloomington City Councilmembers to US Secretary of Transportation Ray LaHood, asking him to look into the way that INDOT is handling the SR 45/46 bypass project. A letter from Bloomington Mayor Mark Kruzan to the Bloomington Economic Development Corporation (BEDC supported the widening). Bloomington Bike & Ped Safety Commission recommendations for the bypass design from 2007. 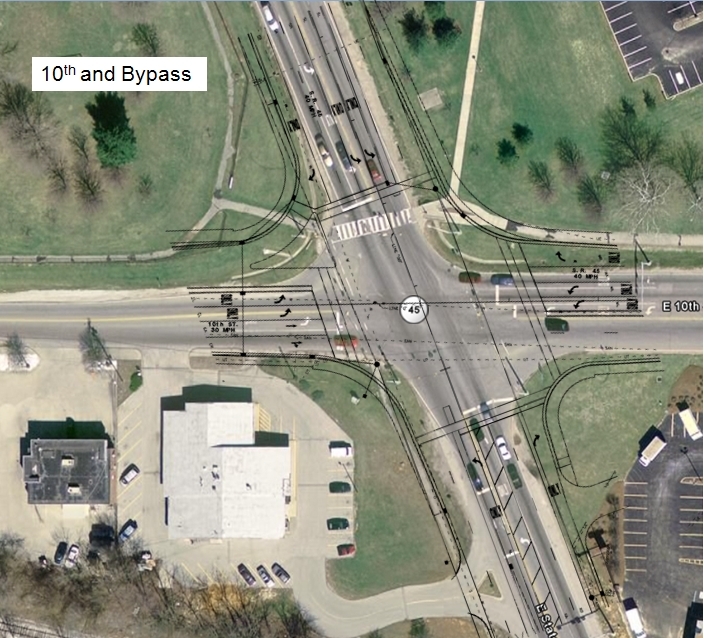 Bloomington Transit recommendations for the intersection of E 10th street (SR 45) and the bypass. A letter from Bloomington Mayer Mark Kruzan about the E 10th street corridor. A letter from B-TOP about the E 10th street corridor.